The iSub V tank TC/VW Edition allows you to set your optimal vaping temperature on your favorite e-liquids for more control, more power and pure flavor making it the ultimate vaping experience with huge clouds. Featuring a large tank that hold 3ml of e-liquid, includes two iSub Coils and a heavy duty Pyrex glass tank making it easy to view your liquid levels. NOTE: Subohm atomizers produce more vapor and sensation resulting in a more harsh or flavorful experience than you may be used to with other tank atomizers. Some harsh eliquds may crack polycarbonate tanks. 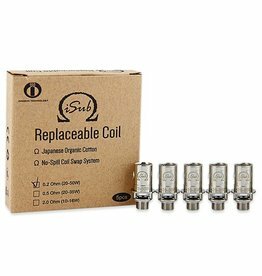 This is a 5 Pack of Replacement Coils for the Innokin iSub S and iSub G Clearomizers.